Last edited by John S on Wed Aug 31, 2011 5:05 pm, edited 1 time in total. 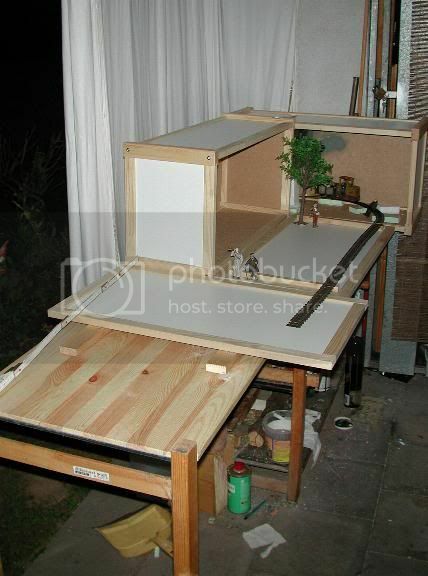 John's cut up Apa Box for a 90 Degree turn is brilliant. Noticed the round edge as well. I came up with a very tight U-turn, which I am not too happy with. Since I paid for the lids, I plan to use them. Last edited by KEG on Tue Aug 30, 2011 6:55 pm, edited 1 time in total. Bob, the idea behind the two halves (which incidentally now feature elsewhere!) was to see if it was possible to fit a curve. 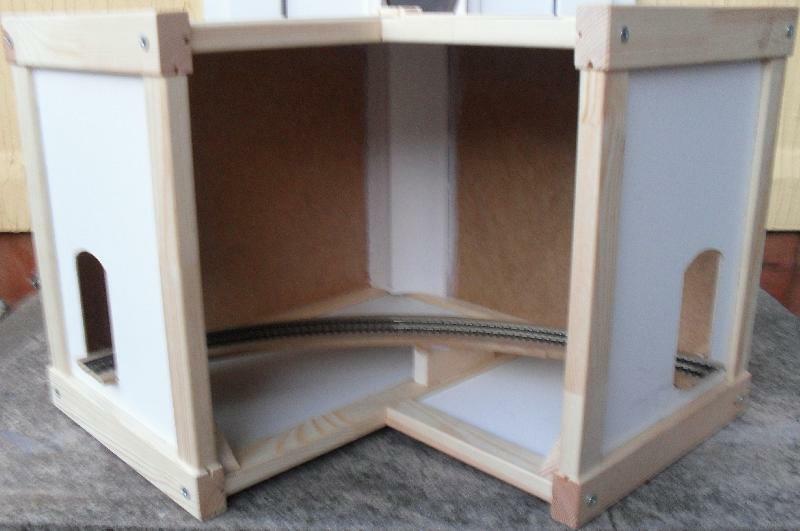 I used a pair of Hornby R605 double curve 1st radius, as ever a compromise between what would fit in the box, what was likely to be run, and as the challenge is to build within the box, and utilising all the original box and lid, the idea seems to work!. Juergen, mainly due to your tinkering with curves, set me on roll! Amazingly versatile these APA boxes have proven to be, not sure what the men in suits from IKEA would make of it though! And Bob again... scenic, do like your culvert and Mozzers idea, and never having modelled water before going to give it a go. Assistance needed for the following, somewhere there is lurking a picture of a rustic wooden railway bridge? 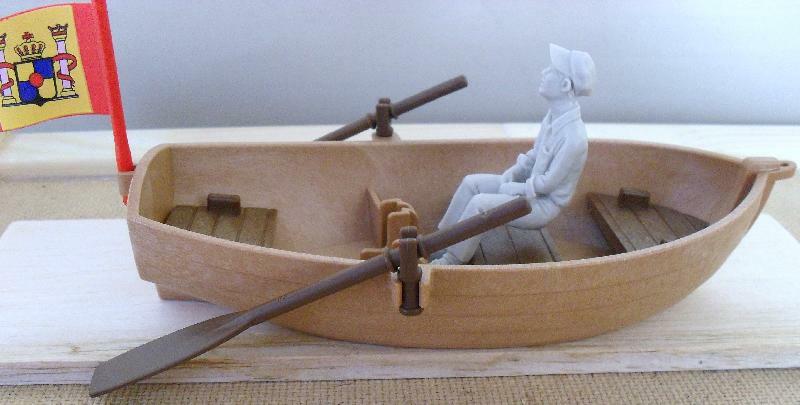 Help needed in locating the little rowing boat . How about a coracle instead? How rustic do you want the bridge to be? Great idea the coracle, and as for rustic that is cool, save at bit on the materials for construction. 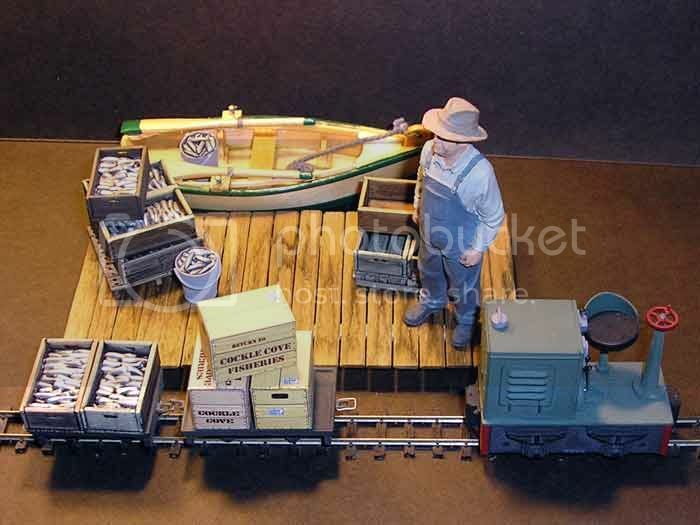 Little rowing boats aren't actually that little in G scale. I doubt that one would fit on the corner module. The one in this old pic is only a 9 footer. Unfortunately my source for these doesn't stock them anymore. They used to be distributed to charity shops very cheaply and you could find them easily, but they seem to have disappeared completely now. All one needs is a suitable set of plans which shouldn't be to difficult to produce if one has a sample to give the required dimensions. Just been playing with 'Paint' and produced a BMP of a 10 foot row boat, ( sort of ). Others more knowledgeable of thing marine might sneer but it suits my needs. 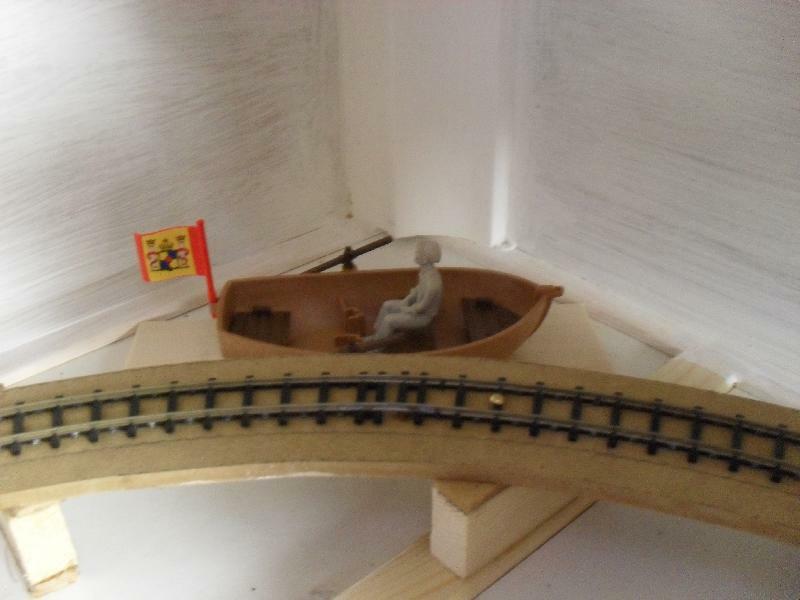 I want a row-boat or two in the future on my pier railway so I will be using this plan to give me a starting point when I get around to building them, probably in thin ply. I am not sure of the best way to post a BMP. But this will have to do as a starter. It may have to be resized to return it to 'G' scale. 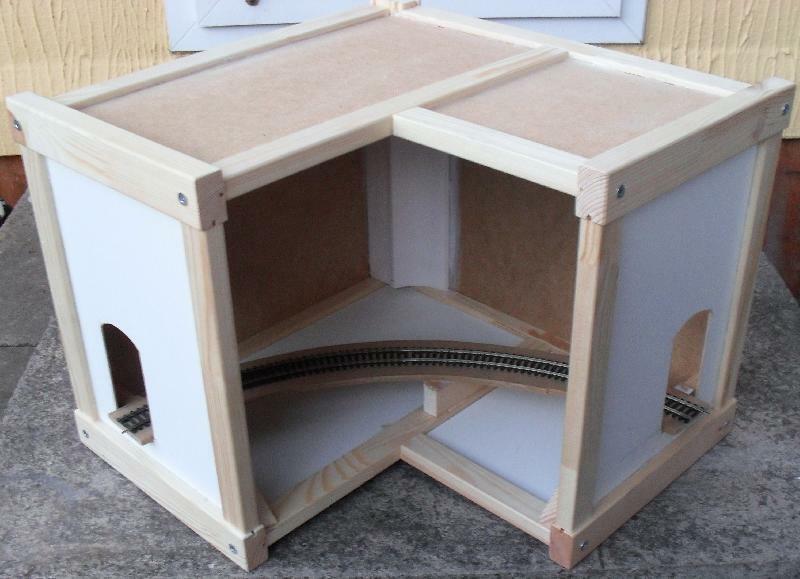 This is a very quick mock-up to test the original plan together with an, as yet, unpainted Jon to see what it looked like in the flesh. Hope that this is of some help to somebody out there. 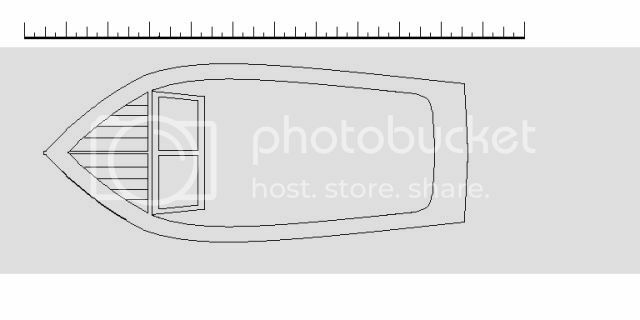 Edit: Just done a quick test and if the file is opened in Paint it will need to be stretched to 200% to suit 'G' scale. Thanks for the kind words lads. I needed a set of plans anyway and the posting about boats set me in motion ! Just 5 mins. 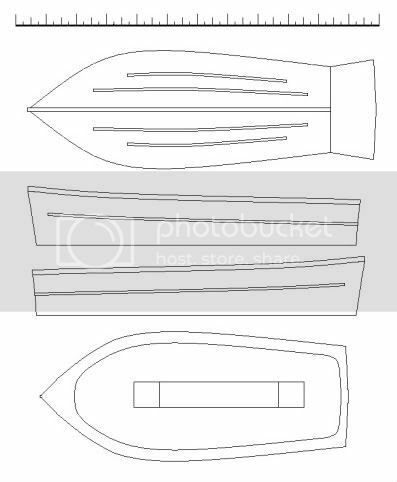 after reading the above I had modified the plan to produce a motor boat type deck using the original deck as a guide. Two Bridge Curve, all wired up and tested. Coving complete, internal of box painted white, if dry later will apply the back scene colour, plus add a pelmet to the front. Again been fiddling with battery powered stick on cupboard/shed led lights from Poundland, these are two for a pound! Same principle, remove the internals, and in this case remove the on board soldered resistor and replace with a higher value, this pair are driven from a PSU from our no longer provider of our internet service, nominal voltage 16v DC, PSU marked as 12v DC, have another pair to tinker with for the other curve, again will try a lower value resistor. 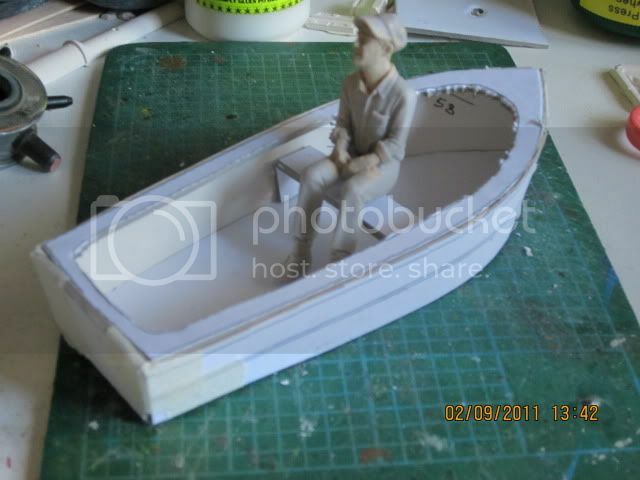 Clean forgot, 99p bid on eBay, one Playmobil Boat, less Jon! Bit of work required, repaint the boat, knock up a small jetty etc, should fit in as snug as a bug in a rug.